Affinity Photo Macros for Photographers will take the workload off processing your images in Affinity Photo. (Macros in Affinity Photo is the same as actions are in Photoshop). If you also want to learn how to use Affinity Photo like a PRO, you can get the Affinity Photo Macro Package + Video Course as a bundle offer and save at least 20% extra. These Affinity Photo macros will help you go from raw, unedited photos from the camera to amazing in no time. 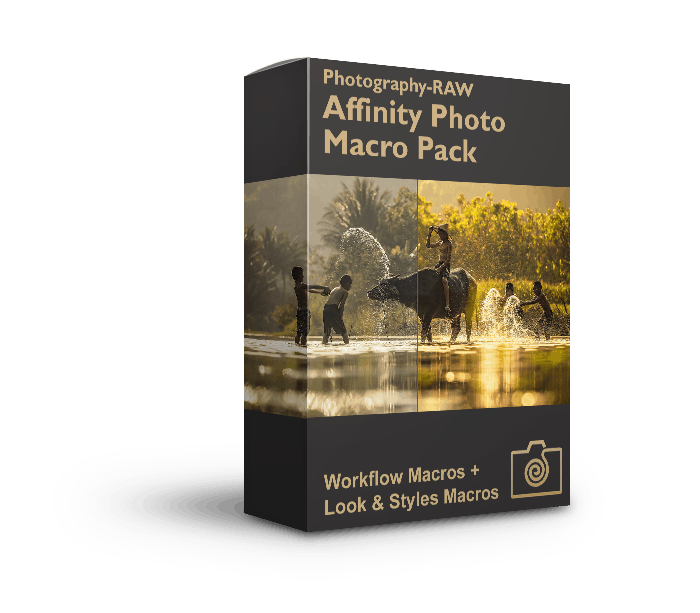 The Affinity Macros for Photographers are designed to help you achieve both the everyday tasks you do again and again in Affinity and special tasks, that are difficult to remember because you only use them occasionally. The Affinity macros/actions are fully adjustable and transparent in letting you see, what they do. Many of the macros enable you to a change the effect strength. You can also double click on the layers generated by the macros to modify the settings, so it fits your particular image. 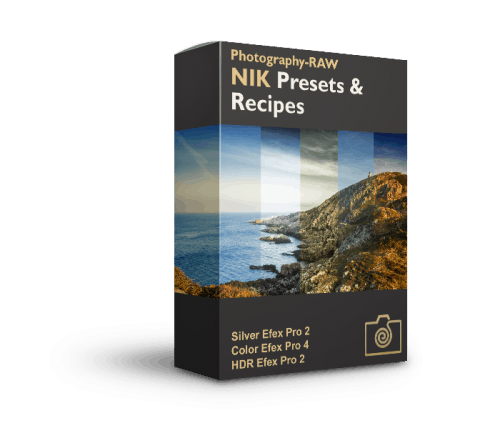 However, the ‘hard work’ of doing a number of specific things in a particular order has been taken care of with these macros/actions that can help all photographers using Affinity Photo to speed up their workflow. Installed and works wonderful. Very time saving. What I really enjoy is If not happy with current results you can change very easy. Absolut must have for Affinity photo users! Check out the product photos above for a few samples of what you can get with the Affinity Photo Macros for Photographers. For further information about what’s included in this package with Affinity Photo macros, please see full product details below. Who are The Affinity Photo Macros Useful For? The short answer is all photographers. You can use these Affinity Macros for all kind of images. 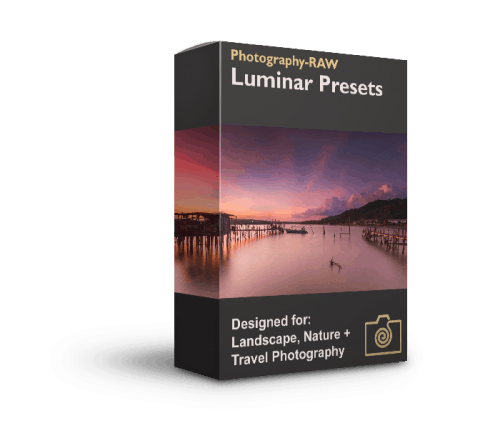 However, I have designed these Affinity Photo Macros with landscape, travel and nature photographers in mind. 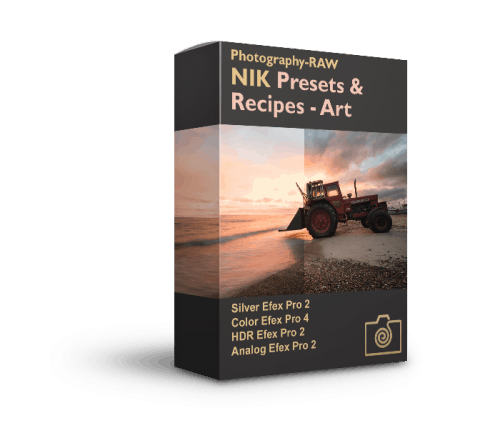 You get a bundle of the best Affinity Photo Macros for photographers who want to quickly take their images to the next level using macros in Affinity Photo. Macros can take care of the complex processes and techniques, while you can focus on achieving the look you want. 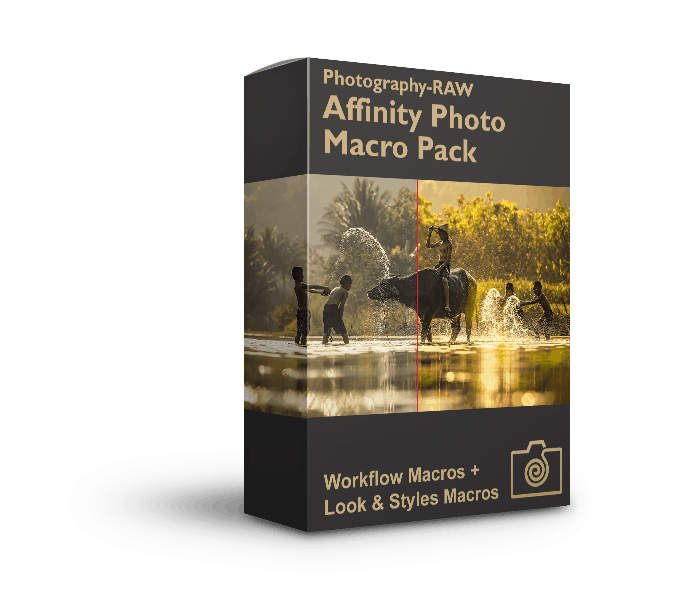 I have created a package of macros for Affinity Photo which is affordable to all photographers, no matter whether you are just starting out in photography and beginning to learn Affinity Photo, or you are a serious enthusiast or a professional photographer. By simply clicking in the Detail Extractor Macro and brushing on the mask, you will “paint” in the hidden details in the image. The right side of this image had a quick brush over with both the detail extractor and high pass dodge and burn macro from the Affinity Photo Macro Pack. What’s included in Affinity Photo Macros for Photographers pack? How To Import The Macros In Affinity Photo? Click on the download link just below the product name. This will start the download of a zip file. The zip file is placed in the default download folder. Locate the downloaded product file and unzip it to a location, that you can easily find again. By default, none of the macro features are displayed in your workspace in Affinity Photo. However, you can easily enable the panels by going to View > Studio > Macro to display the macro recorder. Next, go to View > Studio > Library to display the macro library where all your saved and imported macros will be shown. Once selected the panels are visible on the left side of the screen. However, you can rearrange them as you like. (You only have to do this the first time you use macros in Affinity Photo). Select the fly-out menu icon on the right side of the Macro Library panel (insert icon), and choose Import Macros…..
Next, you should find and select Affinity Macro file, that you wish to import and click Open. In this way, you can import one macro category at a time. To import more you should select the fly.out menu again and choose Import Macros. The Affinity Photo Macro Pack includes two macro categories that you need to import: Workflow macros and Looks / Styles Macros. Several of the macros comes with settings (like effect strength) that you can set when running the macro. If not, just double-click on the extra layers that the macro creates, to modify the settings. You can the macros can be adjusted with the layer opacity slider if nothing else is mentioned below. If you don’t like the effect you can easily undo the effect. Just press CMD+Z (Mac) or CTRL+Z (Win). Even though the macros consists of several steps when Affinity Photo runs the macro, it does so as a single step in the history log, so you only need to press undo once. The Dodge and Burn Layer gives you the possibility to burn and dodge your image in a non-destructive way. Run the macro and choose a brush suitable for darkening or brightening specific areas in your image. With the Dodge and Burn Layer selected, choose white and paint on the areas you want to brighten. Choose a black color for the brush to darken areas. If the effect is too strong, just turn down the opacity of the brush. Usually, between 12-20% brush opacity gives you a nice subtle darkening or brightening effect to your image. 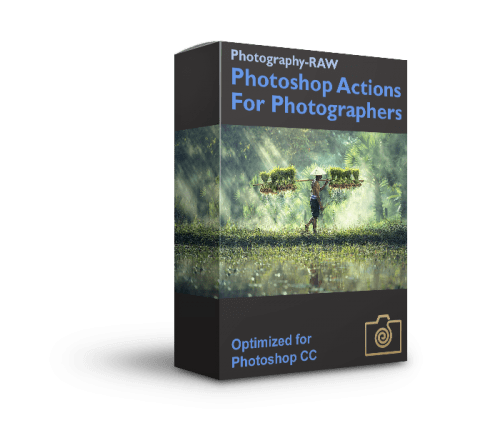 This Affinity Photo macro utilizes a high-pass filter, which is usually used for sharpening, to dodge and burn. It will help bring out details by focusing on much larger details than you would normally use for sharpening. Running the macro will give you black mask where you just need to brush over the areas where you want to dodge and burn. The brush already activated and ready for you to sweep over your image where you want extra highlights or shadows. Use the brush opacity to control the strength of the effect. 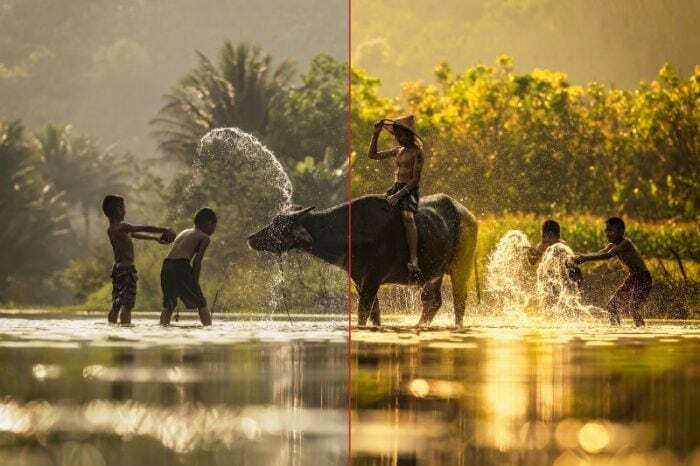 You don’t need to switch between a separate dodge and burn tool as the high pass filter will automatically darken and brighten when you use the brush. For a more subtle effect, change the blend mode of the layer to Soft Light. The default setting is Vivid Light. Alternatively, you can also lower or raise the opacity of the layer to decrease or increase the effect. This macro increases the visible details in the image along with the contrast. If you find that it is too much, just lower the opacity of the Structure & Contrast layer. The Detail Enhancer uses an inverted surface blur filter to bring forth the hidden details in the image. After running the macro, select the mask on the Detail Extractor Brush layer and paint on it with a white brush on the areas where you want more details. You can adjust the effect by changing the opacity of the brush. The Pro Contrast Affinity macro adjusts the shadows, highlights, and mid-tones separately, by using luminosity selections. After running the macro, you can modify the contrast curves to fit your image. 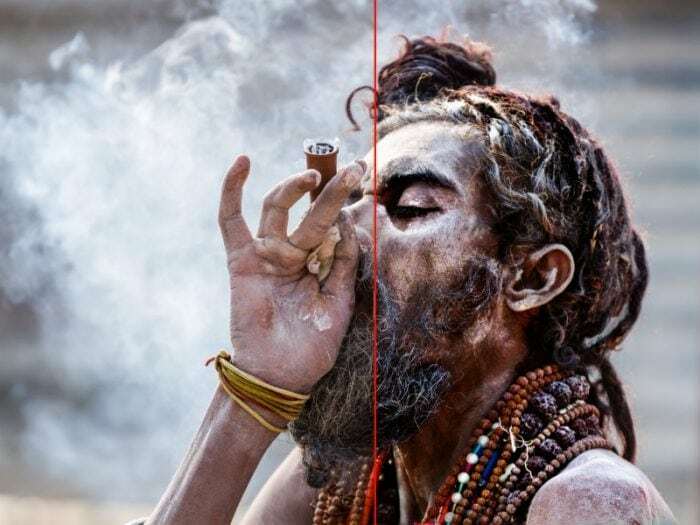 Click on this macro to create a layer mask that detects the edges in your photo. The layer is set to invisible as a default because you would normally no display this layer. However, if you click CMD (Mac) / CTRL (Win) + left click on the layer thumbnail Affinity Photo will create a selection where only the edges are selected. You can use this for various precise modification, like sharpening that only affects the edges in your photo. When you run the macro you get the option to change the Edge Radius. You will get the best results if you keep this below 5 px. These Affinity Photo macros simulate typical movie coloring. It uses cool blue/green tones in the shades, while the brighter areas get a warmer, orange look. 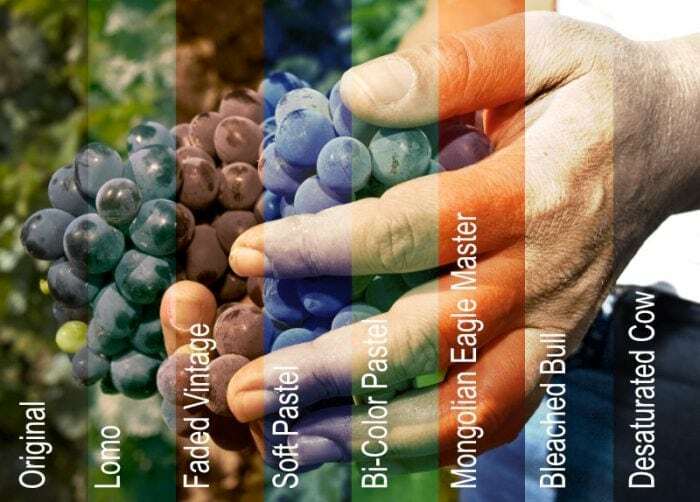 The effect makes persons stand out more because of the complementary color relation used in the toning. Give your fall images a color boost with the Fall Foliage Effect macro. The macro will create a hue adjustment layer, that targets specific fall colors to increase the saturation. In addition, it adds a high pass filter for increased sharpening. To adjust the strength of the colors double click the thumbnail for the hue adjustment layer and modify the settings. This macro simulates using a golden reflector at the scene. It creates a live lighting adjustment layer. Double click it to adjust the light diffusion, direction, and strength. Add a dreamy, soft, fantasy-look to your images with this Affinity macro. The Orton effect is achieved by blending a sharp image with an “out of focus” version of the same image. Per default, it is applied to the whole image, but I suggest that you apply it selectively by using the mask the macro creates. This macro is usually great with sunrise shots. It boosts the yellow and red colors a bit. Furthermore, it increases the vibrance, clarity, sharpness and contrast. Finally, it also adds a very subtle vignette. Everything non-destructively and you can modify each adjustment layers and live filters the macro generates. This Affinity macro converts your image to black and white and adds a little Sephia tone to it. What software do I need to use these macros? You only need Affinity Photo version 1.5 or above to use these macros. You can get it here. Feel free to get in touch with any question you have about these macros for Affinity Photo. If you already bought the macros, please include the order id in the mail. It’s really simple. You can find the full description above. Download the Affinity Photo Macros immediately! Get an instant download file after buying. You can begin to use the best Affinity Photo Macros, in a matter of minutes. You can pay using your credit card. 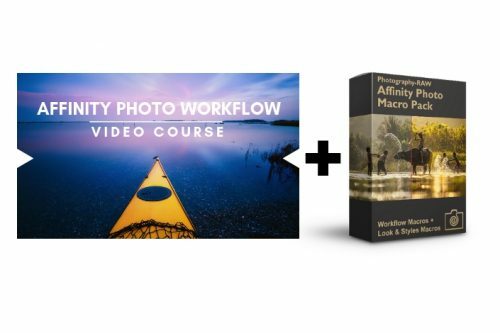 I want you to be happy when you buy this Affinity Photo Macros for Photographers package. And I’m confident that you will be, and that it will help you become a better photographer. If, you’re not satisfied with the product, please tell me and I’ll issue a refund for the full amount. No questions asked. Download the Affinity Photo Macros and install them in Affinity Photo, instantly after buying. Just click add to cart above. Absolut must have for Affinity photo user! I love the macros. Very beneficial as I transition to Affinity from Photoshop. Make more please!!! The actions are what I miss most! I appreciate the videos as well. I’m sure they will make this transition easier also. Thank you! Easy to install. The workflows are great time savers. Ces macros fonctionnent très bien et elles sont excellentes. Je suis très satisfait de mon achat et je les conseille à tous les utilisateurs d’Affinity Photo. Those macros works very well and they are excellent. I am very satisfied with my purchase and I recommend them to all users of Affinity Photo.